If the sharing economy movement is to play a role in shifting society away from the dominant economic paradigm, it will have to get political. And this means guarding against the co-optation of sharing by the corporate sector, while joining forces with a much larger body of activists that have long been calling - either explicitly or implicitly - for more transformative and fundamental forms of economic sharing across the world. To add a further layer of confusion to the debate, there is little agreement on what the sharing economy actually is. For example, Rachel Botsman - a leading proponent of the ‘what’s mine is yours’ philosophy - argues that the sharing economy forms part of a much wider collaborative economy that leverages technology and trust to facilitate a more efficient distribution of goods and services. A broader definition has been put forward by The People Who Share, who regard the sharing economy as an “alternative socio-economic system which embeds sharing and collaboration at its heart – across all aspects of social and economic life”. Friends of the Earth have also significantly expanded the discourse on sharing to include the political sphere, albeit focussing on city-wide sharing as a means for improving environmental sustainability and equity among citizens. Clearly the global sustainability crisis cannot be addressed effectively until the structural factors that are responsible for creating these inequalities are fully addressed, and this has huge implications for transforming government policies and economic systems both nationally and globally. A huge array of reforms are needed to reconfigure the way nations extract, produce, distribute and consume resources across the world. For instance, this would include rethinking our notions of progress and prosperity, ending the dominance of consumption-led economic growth over government policy, and reversing the relentless push towards trade liberalisation. As endlessly debated by civil society groups, much also needs to be done to dismantle the culture of consumerism, reconceptualise financial measures like GDP, and shift investment towards building and sustaining a low-carbon infrastructure. The need for public sector-driven solutions is also evident in relation to tackling poverty and inequality which, in simple terms, requires governments to ensure universal access to essential goods and services. 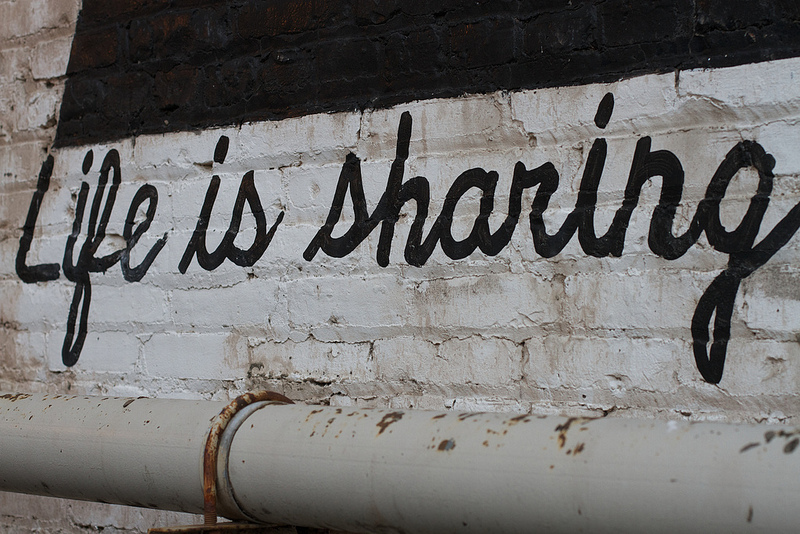 But instead of promoting or facilitating these fundamental aspects of economic sharing, most sharing economy supporters tend to focus on the collaborative (and often for-profit) sharing of household items, cars or spare rooms - not the resources that people most desperately need to be shared today such as nutritious food, healthcare and essential public services. Similarly, while sharing in terms of charitable giving and voluntary assistance within communities can help redistribute wealth and alleviate some instances of human deprivation, it cannot address the structural causes of poverty and inequality that have their basis in public policy. In some cases, focussing on new sharing economy platforms, technologies and initiatives could even undermine more effective and established systems of national sharing. For example, while car sharing schemes are clearly good for the environment, a universally accessible public transport system is undeniably better. Indeed public transport can be regarded as a greener citywide or nationwide sharing platform - but few people promoting the sharing economy are advocating to improve such services. The intense focus that the sharing economy places on individuals and the private sector might also explain the recurring issues around sharing-oriented businesses flaunting regulatory and licencing conventions designed to protect society at large. Many supporters of sharing economy initiatives think that sharing is fashionable and trendy - a lifestyle choice - and that by sharing they are doing their bit to promote egalitarian or environmentally conscious ethics and values. But if the sharing movement is to play a role in shifting society away from the dominant economic paradigm and help to resolve global crises, it will have to get political. This means recognising that sharing economy advocates are part of a much larger body of people calling for more transformative forms of economic sharing in relation to pressing social and environmental concerns.